This summer has been a summer of jihad in Europe. As European leaders surrender to Islam, Islam is attacking Europe. When all of the attacks are seen in list form, it is hard to deny the West is at war. June 1, GERMANY: A father of two is stabbed to death by 2 Muslims for smoking during Ramadan and refusing to fast. June 3, ENGLAND: 3 muslim migrants shout “this is for Allah” & plow into pedestrians on London Bridge, then proceed to a market, where they stab anyone within reach. 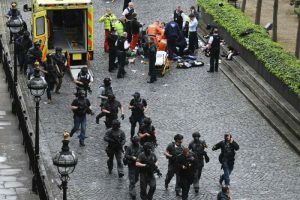 Eight are killed. June 6, FRANCE: A muslim attacks a police officer with a hammer outside the Notre Dame cathedral. June 7, ENGLAND: An unveiled woman is slashed with a knife by three muslim women invoking quranic verses. June 18, FRANCE: A Jihadi stabs a French farmer while yelling praises to Allah. June 19, FRANCE: A muslim man detonates a bomb inside his vehicle and smashes into a police van near the Champs-Elysees. Only the jihadi is killed. No other injuries. June 20, BELGIUM: A muslim shouting “allah u akbar” detonates a bomb in the Central Train Station in Brussels. Jihadi is killed. No other injuries. June 30, AUSTRIA: A muslim slits the throats of an elderly couple in their home. July 17, ITALY: A muslim migrant stabs a police officer while yelling about being a martyr for Allah. July 28, GERMANY: A muslim yelling praises to Allah rushes into a supermarket and stabs five people, one of whom dies. August 9, FRANCE: A muslim living illegally in France deliberately plows his car into a group of soldiers. August 16, SPAIN: A woman is killed in a house blown up when an Islamic Imam accidentally detonates a bomb. August 17, SPAIN: A muslim driver mows down over a hundred pedestrians along a venue, killing fourteen, including a 3-year-old and his mother. August 18, FINLAND: A man yelling “Allah u akbar” stabs two women to death along a city street. August 19, RUSSIA: A muslim stabs eight people outside a row of shops. All of these attacks are LAWFUL under Islamic Sharia. Regrettably it must also be stated for those who do not understand the threat that all these attacks are UNLAWFUL under the Sovereign Laws of the Lands where they took place. Furthermore, although “Europe” consists of 51 countries, the 3 most visited cities on the face of the earth are London, Bangkok (Thailand) and Paris; thus the economic damage to tourism they do is clearly a significant element or their mendacious target selections. The enabling root of the ever expanding nature of much of this, however, has been the now indelible cover-up line of the suppositional (and treasonous) dime novel narrative known as the “9/11 Commission Report”, I.e., “Our aim has not been to assign individual blame” (notwithstanding that the predicate for the very existence of said panel was to investigate the mass murder of 2777 mainly American citizens by sharia-adherent terrorists consequent of their now two unresolved declarations of war against the United States on behalf of Islam. In 1866, presumably consequent of critical advocacy regarding the use of a military tribunal to try the domestic conspirators involved in the Abraham Lincoln assassination plot (who the U.S. Attorney General at the time characterized as enemy combatants) the U.S. Supreme Court, nevertheless, in Ex parte Milligan, banned their further use in places where civil courts were operational. Inasmuch as the limitation of said 19th century high-court decision, however, wasn’t applied during the 2nd world war due to President Franklin Roosevelt’s order to use a military tribunal to try 6 of the 8 German enemy-combatant saboteurs who deployed on Long Island after having reached the United States from France aboard a Nazi U-Boat, and who long after their conviction at the Department of Justice were electrocuted at the Washington D.C. jail, the re-establishment of military tribunals dedicated to the prosecution of sharia-adherent enemy combatants – and anyone indicted for treason threaded to aiding the Global Islamic Movement’s demonstrable on-going attempt to supplant the U.S. Code of law with the draconian 7th century version of hell known as sharia – might arrest the country’s spiral into oblivion. Too, in view of recent disclosures by a critically ill CIA retiree claiming to have taken part in the controlled demolition of World Trade Center 7 (at the behest of his senior officials) because — “when you are a patriot, you don’t question the motivation of the CIA or the white House, you assume the bigger purpose is for a greater good” — each person present at meetings of the so called “War council” mentioned in said 9/11 Commission Report report should be compelled – by whatever emergency extra-legislative & extra-judicial measures it takes, sans even a hint of elitist immunities – to testify before a special grand jury mandated to remain in existence for as long as it takes to discover, and report on to the American people the contextual truth. The above (quoted) reference to “a greater good” is a phrase associated with utilitarianism, which according to its’ founder, Jeremy Bentham, is the sum of all pleasures that result from an action, minus the suffering of anyone involved in the action. Which brings to mind the pseudo-science known as “eugenics”, I.e., the belief by a variety of nut cases (Adolf Hitler, and Oliver Wendell Holmes [in the Buck case] included) that certain classes of human beings are unfit to live, thus should be liquidated in the interest of “a greater good”.